Make your own concealed carry rig for auto, bag, backpack, etc. This ingenious item has 2 parts, the holster and a flat square nylon piece covered in hooks for velcro to attach to. 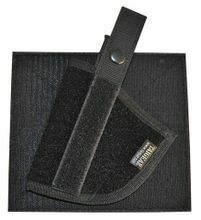 The holster is covered in velcro and can be positioned at various angles on the square piece. The holster also has a retention strap with a snap release. You can use this to carry your pistol in your purse or center console of an automobile or place in any bag or back pack. This unit allows you to position the gun to allow for a fast draw while keeping its position in the bag or compartment consistent. Attaches to any Velcro surface on vests, leg rigs, pouches, gear bags, etc. Fits most average standard size pistols. For example a Tauras 92F 9mm just fits.